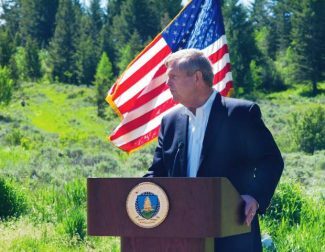 U.S. Secretary of Agriculture Tom Vilsack addresses trail workers in Jackson earlier this year while calling on Congress for a better funding source for firefighting. The current system frequently eats into the U.S. Forest Service budget and prevents the agency from doing its job, he said. Photo by Angus M. Thuermer Jr. Require 1 million acres prescribed fire annually. Complete environmental analysis for some projects in 180 days and limit them to 100 pages. The chief of the U.S. Forest Service criticized U.S. Sen. John Barrasso's forest health bill Thursday saying it would limit public involvement, upend multiple use and ignore forests' biggest threat — a bad firefighting budget. Barrasso has a distinctly different view of his "National Forest Ecosystem Improvement Act of 2015." The bill, S.1691, would allow special rules for "ecosystem restoration projects," including logging, thinning trees and burning with prescribed fires. The aim is to "improve forest and watershed health, reduce large scale wildfires, increase wildlife habitat, and support communities across rural America," Barrasso said in a statement June 29 announcing the legislation. U.S. Forest Service Chief Tom Tidwell delivered his prepared comments and criticisms at a Senate subcommittee hearing. The Obama administration opposes the bill that would require those who challenge environmental decisions in court to first post a bond, Tidwell said. And the administration is against setting in stone the amount of acreage that must be cut or burned annually. Barrasso's bill calls for 1 million acres of "mechanical treatment" — logging and thinning — a year, almost half of it commercial. The aim, in part, is to establish a reliable timber supply that would help fund ecosystem restoration. Hulett's Jim Neiman, whose family owns three sawmills and a pellet mill in the Black Hills and another sawmill in Colorado, backed the bill. Neiman Enterprises supports about 750 families in four states, he said. Oregon logger Steve Swanson, who owns two sawmills and a plywood mill in the Pacific Northwest, also supported Barrasso. He told of sagging rural economies and counties in southwest Oregon "on the brink of insolvency due to reductions in federal timber receipt revenues and the lack of private sector employment." "I am not suggesting we turn back the clock to the so-called timber heydays," Barrasso said at the hearing. "That is not realistic, but we can't allow the status quo to continue." The bill also would see 1 million acres of prescribed fire annually and imposes requirements and restrictions on projects' environmental reviews. The forest service spends more than $356 million annually reviewing projects, Barrasso said. The bill "reduces extraneous lawsuits against projects by making an action challenging an ecosystem restoration project subject to a bonding requirement." Parties filing suit would have to post a bond that would cover the costs of the government's defense, and surrender that amount if they lost. "This may seem harsh to some but it has existed on tribal lands without incident," Barrasso said in opening remarks. But bonding would set up an "inappropriate barrier … and would limit public participation in decision-making," Tidwell said. Some challengers would have no access to courts under the bill and would instead enter "an innovative arbitration process," Barrasso's statement said. But any attempt to change the system by requiring arbitration should first undergo a test, Tidwell said. Tidwell also wouldn't support a one-million-acre annual "mechanical treatment" quota. That would be hard to meet because of "agency and industry capacity, current market realities, and competing priorities," he said. The forest service surpassed its 2014 timber harvest goal of 2.9 billion board feet, a program that has grown 18 percent since 2008, Tidwell said. "The agency is achieving these results despite the fact that since 1998, National Forest System staff was reduced by well over a third." The bill would require some additional environmental reviews while eliminating others. Instead of studies that consider a suite of projects, in some cases the bill would require individual analyses. In such cases environmental reviews would be completed in 180 days and be no longer than 100 pages. Tidwell said that would create unnecessary work that couldn't be accomplished on time. Projects aimed at stemming insect or disease infestation, hazardous fuels, and promoting community wildfire protection would not have to undergo environmental reviews. Projects improving municipal water sources and water yield and those proposed by collaborative partners — usually state and local interest groups — also would bypass review. The method the bill would use to skirt environmental reviews would be an existing provision called a "categorical exclusion." That determination is applied to a project where the impact is so small it requires no analysis. The bill would allow such determinations to be made on projects that would stretch across as much as 15,000 acres. That would upset the agency's studied use of the categorical exclusion tool, Tidwell said. Categorical exclusions are employed today only after a project's design, scale and compliance with environmental laws are weighed. Barrasso's bill would upset that balance, Tidwell said. Tidwell and Barrasso have opposing views of the relationship between firefighting and programs to improve forest health and reduce wildfire threats. Under the existing budget Congress has allocated to the forest service, the very act of fighting fires cuts into programs that seek to reduce fire danger, Tidwell said. Congress should embrace the administration's plan to pay for the largest fires from an emergency fund instead of sapping the agency's programs, Tidwell said. Today's system results in "funding transfers" to the firefighting account that diminish other forest service programs, Tidwell said. Adopting the administration's emergency funding plan would allow the agency to better restore forests, "helping forests adapt to the growing effects of climate change, and preparing communities in the wildland/urban interface for future wildfires." Barrasso sees it differently. The U.S. Forest Service estimates up to 82 million acres of forest land are in need of "treatment," he said. Environmental rules and lawsuits "are draining U.S. Forest Service budgets, delaying desperately needed and time-sensitive forest health projects, and preventing dollars from being spent on the ground where they will do the most good," he said. "To be clear, our forest management problem is not simply a fire budgeting or money problem — it is a prioritization problem," Barrasso said at the hearing. "Right now, I see no higher priority for the Forest Service than treating our forests to make them healthy again." The Obama administration has made Tidwell's point about the firefighting budget for months. That includes statements made during a visit to Jackson by U.S. Secretary of Agriculture Tom Vilsack and Tidwell himself. Despite its opposition, the forest service and U.S. Department of Agriculture "agree with the intent of this bill to increase the pace and scale of restoration," Tidwell said.